We continue our coverage of Motor Week from Monterey with photos from the world famous Pebble Beach Concours d’Elegance, and the Motorsport Reunion historic car races. We visit just a few of the great gas stations along Route 66. Then we have a huge selection of NorCal events for you to check out; Billetproof, NorCal KnockOut, Hot Rod Party, and Castro Valley Car Show! 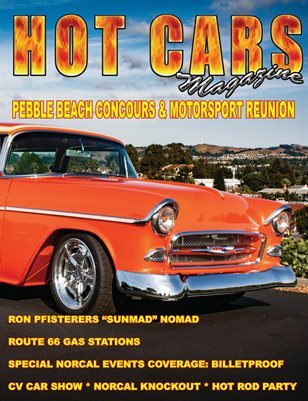 Our feature car in this issue is Ron Pfisterers amazing “Sunmad” 1955 Nomad!